Kolacara apples are distinctively flat and wide in shape, rather than a more round or conical, and can be uneven. The skin of this variety tends to be tough, and is yellow-green in color overlaid with a red blush and striping. The Kolacara apple’s flavor is subacidic, sweet, sharp, and refreshing, making it a good apple to eat fresh rather than cooked. Inside, it has firm, creamy white flesh that can be mealy at times. The Kolacara apple tree is vigorous in its growth habit and produces its fruits on spurs. Kolacara apples are available in the late fall and winter. The Kolacara (or Kola?ara) apple is an heirloom Balkan variety of Malus domestica, not well known outside of the region today. It is not clear what the parentage of Kolacara is. Other names for this variety are Kolatchara and Koltchara. Apples contain a variety of nutrients, especially near the skin. Kolacara apples are particularly nutritious, since they have a higher amount of Vitamin C than average. One medium apple has about 81 calories, along with 4 grams of dietary fiber, 8 mg of Vitamin C, and smaller amounts of calcium, phosphorus, Vitamin A, and folate. Enjoy the Kolacara’s unique shape by eating it fresh out of hand, since it is best used as a dessert apple. Pair as a snack with peanut butter, cheddar cheese, or maple syrup, or cut up into salads and serve with root vegetables, citrus, pears, or celery. Kolacara is a good storage apple—it will last up to three months or so in proper cool, dry storage. Interest in antique or heirloom apples has been growing over the past decades. 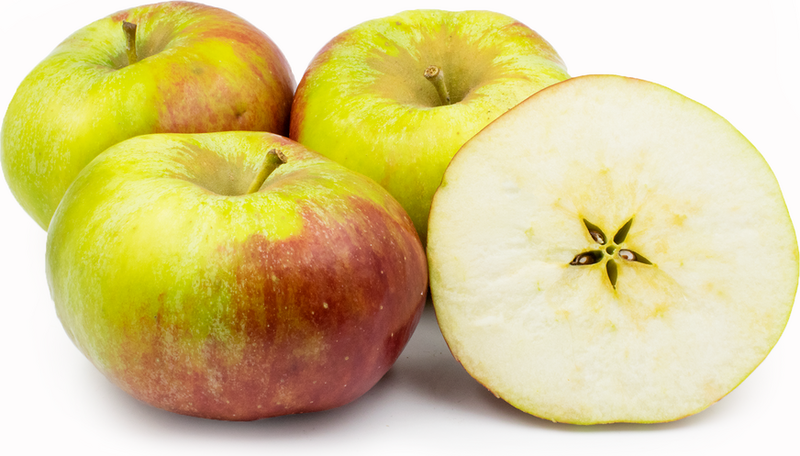 Kolacara is an example of an heirloom apple variety that has been preserved over time. Maintaining older apple varieties ensures that there are a diverse number of apples growing, some of which may be well suited for new growing techniques and changing climates. Diversity in apple stock also allows for better breeding of new apples. In Bosnia and Herzegovina, as in other parts of the apple-growing world, local heirloom varieties of apples are being cataloged and collected systematically. Kolacara apples are from Serbia and Bosnia in the Balkans, which is the home to a number of old apple varieties. The Balkans have historically been a place of trade and cultural mixing, bring new apples from the east and the west. They were known in Britain by at least 1936. In the 1930s, Kolacara was a popular apple at winter markets. Recipes that include Kolacara Apples. One is easiest, three is harder.